Celebrating the sacraments is at the core of our parish life. Through the sacraments we celebrate our life in Christ. In the sacraments we are strengthened by the presence of Christ. The sacraments invite us to ”become what we receive” and to witneses to Christ in our everyday lives. Here we provide all the details for the celebration of the sacraments in our parish. To arrange a funeral ceremony please contact one of the priests. 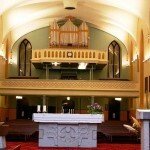 Rath Church: The third Saturday of each month at 4pm. Congratulations on your decision to get married. For details on all aspects of your Church marriage arrangements and preparation please click on the link below. Confirmation ceremonies take place from March until May. A programme of preparation takes place throughout the year. For dates and details please click below. First Communion ceremonies take place in the month of May. A programme of preparation takes place throughout the year. For dates and details please click below. Portarlington Church:- Every Saturday at 12.00 noon. Every First Friday of the month, the priests visit the housebound with Holy Communion. If you are unable to attend Mass due to illness or frailty and would like to be visited by a priest on the First Friday, please feel free to contact the Parish Office, Tel: 057 864 3004, or any of the priests, to be included on the First Friday visits. If you have an interest in finding out more about the path to priesthood or the permanent diaconate in this diocese, you are very welcome to contact our Diocesan Vocations Director. Click below for details. © Copyright 2010 Parishes of Portarlington & Emo, Diocese of Kildare & Leighlin. All Rights Reserved.